Food Safety Modernization Act (FSMA) co mpliance dates are approaching, with many companies required to establish a food safety system that analyzes hazards and implements risk-based preventive controls. A Hazard Analysis and Critical Control Points (HACCP) plan has long been one of the main standards for developing such a system. Integrated Food Safety Management System (FSMS) software provides a simplified way to streamline compliance with the new requirements. 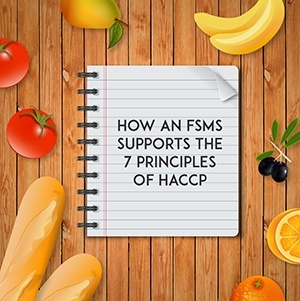 To see how, this post will look at the ways an FSMS supports the 7 principles of HACCP. Log and track identified hazards in a centralized Risk Register. Perform quantitative Risk Assessment on hazards to determine which ones need controls. Leverage data you already have by integrating with Corrective Action systems and Audit Management software. Pinpointing Critical Control Points (CCPs) where control measures are needed is one of the most important steps of the HACCP process. Use a simple decision tree that tells you whether or not a control point is a CCP. Identify existing risk mitigation practices by giving you a comprehensive, detailed view of processes, hazards and controls already in place. Verify proposed controls sufficiently reduce risk by measuring residual risk associated with implementing the control. Critical limits are scientifically based threshold values for biological, chemical or physical parameters (such as temperature, humidity or pH) that reduce the risk of foodborne illness. Link critical limits to regulations, standards or other scientific results. Centralize process documents that clearly outline critical limits within a secure, permissions-based Document Control system. Automate routing of planning documents for streamlined collaboration within teams. Having well-defined monitoring procedures ensures that your production methods actually keep process parameters within critical limits. Centralize monitoring procedures in your Document Control system, providing a comprehensive resource for established processes and protocols. Create workflows and assign action items to individuals to ensure that monitoring procedures are followed. Incorporate monitoring procedures into Employee Training to ensure protocols are reflected in training materials, and that any changes also involve updates to training requirements. Link production systems with FSMS dashboards to automate monitoring and reduce human error. Because nothing ever goes exactly as planned, HACCP requires you to have Corrective Action procedures that minimize the risk of repeat occurrences. Automate routing of corrective action requests through review, root cause analysis, action taken and verification. Dashboard alerts and escalation rules for when tasks are overdue ensure critical items don’t fall through the cracks. Create corrective action templates that standardize how you handle different types of deviations from established critical limits. Determine whether the corrective action reduced risk using a residual risk assessment as a verification step. Maintain a detailed record of corrective action and risk management activities. An effective HACCP requires frequent review and verification that what’s happening in your plant is going according to plan. Create a verification schedule that outlines verification activities and their frequency, plus who’s responsible for managing and reviewing the verification. Centralize all records related to initial verification, including scientific studies and expert input as well as in-plant observations and measurements. Integrate your audit program with HACCP documentation to monitor how established procedures are actually being put into practice by employees. Link your Corrective Action system to verification activities so you can make adjustments as needed while ensuring problems aren’t allowed to persist. Hazard analysis summary and rationale behind hazards and controls. The HACCP plan itself, including team members involved and a verified flow diagram. An HACCP summary table with information on how you’ve implemented all of the 7 steps. Validation records and other records generated during plan operation. An integrated FSMS helps you to centralize all these records, making it easy to pull up reports and communicate with regulators in just a few clicks. Ultimately, an FSMS isn’t an end-point solution in and of itself. To be truly effective, it needs to be informed by solid science and proactive monitoring. However, with an FSMS in place, food safety professionals have the tools they need to manage all of the many moving parts.